I've posted about BASK previously here; that was my first experience with the company. I recently placed another order during the Mother's Day sale and again I have to say the customer service is outstanding. There was a problem with the site, and I contacted the owner Rashida. She responded quickly and was very helpful. She did a custom order for me order through her Etsy shop. I didn't know which items were in stock because some had already sold out that first day, so I just listed what I was interested in hoping that I might still be able to order them. Thankfully, I got all of the products I wanted...and I must say they are delightful! Condensed Custard in Lemon Beignet: It smells edible. YUM!!! The fragrance reminds me of Marc Jacobs Biscotti Splash. The texture is soooo thick and creamy...and I just want dessert when I open it. I'm slightly fearful of putting this all over my body or hair simply because I'd be having cravings all day! Can't wait to try it though. Silk & Honey Latte Detangling Hair Milk in Cucumber Honeydew: If you put your face in slice of honeydew, and breathed in deeply, this is what you would smell or very near that. It also reminds me of biting into a Starburst. 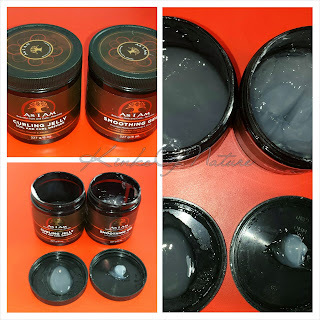 I did a few strand tests on dry hair, and it's very moisturizing and smoothing. Summer Body Oil in Apricot Colada (sample): it smells like a daiquiri--Miami Vice style. Great fragrance for summer. It's pretty light. I don't know if I would purchase the full size because the ingredients are grapeseed oil, coconut oil, vitamin E, and fragrance. It's something I could mix on my own, BUT if the price is right I might consider it, and by "right", I mean relatively low. Cupuacu Coco-Nilla Body Massage Serum: I had the sample of this previously and liked it enough to get the full size. It smells like coconut cream and vanilla. Nice. The one I had originally was a bit thicker, but this one is thinner. I'm not sure if the consistency changed in transit due to the heat, or if the previous one was thicker because it was winter. I don't know; I'll ask the owner. Either way, love this on my skin and hair. I may have somehow discovered that it tastes sweet, but be warned this is not for consumption. 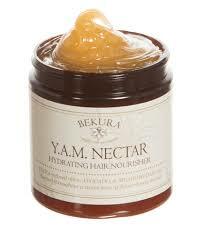 YAM Nectar Intense Hair Nourisher: This was the main product I wanted, but it was listed as out of stock on the site so I wasn't certain I'd get it. I'm glad I did. Y'all know this is one of my staple products. I have to have it. Simple as that. I previously had a sample; I was one of the testers before it was released. The fragrance has changed. To me, it smells like the lemon beignet fragrance mixed with the natural fragrance of the honey. Mine is very runny. If I tilt the jar, it will pour out. The one I had previously was very thick, and there wasn't much movement in the jar. I'm not sure why it's like that because I had my old one shipped to me, and the temperatures were similar. In fact the old one was shipped over two weeks, and the new one only a few days. I'll update the post after I contact the owner. I will say I tested the product by mixing it with water, and it performs the same. I still love this, but I am terrified of the mess that could potentially occur. I can't rate any of the products yet, but later I will do my full review of each as I try them. Overall, I love BASK products. The quality is AMAZING! The customer service...AMAZING. I'm just waiting for Rashida to release a shampoo or cleansing conditioner, a protein treatment, and a gel. Hopefully, the gel comes first. Please and thank you! This is a not-so-subtle hint, and I oh so hope she reads it. BUT seriously, if she made the above items, it would be covering all of the bases for hair care, and one could potentially use the BASK line solely. I love trying different products so maybe not "me", but someone could. I'm always excited when I see that a new BASK product is being released. I have always had a great experience with her products, and will continue to purchase. Even now, I'm kicking myself for not getting any of the sugar scrubs or that Truffle Butter. SMH. Next time. Wonderful review. And I agree with you. The products from this line are l.o.v.e.l.y!!!!!!!!! Yes, they are! Thanks for reading.